Are you searching for a convenient yet secure way to showcase your tablet computers or simply need to integrate touchscreen technology into your presentation? 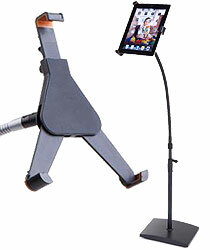 These sturdy iPad podium display stands will make sure that your showcases won't be missed. Tablet computers are becoming increasingly popular these days, and public speakers as well as retailers are discovering just how well they can work in a variety of settings. Our affordable iPad podium display stands for Apple tablets allow you to create an interactive display just about anywhere. 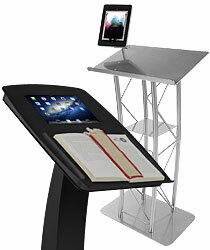 The tablet display stands can also be used when giving a speech or presenting other information to an audience. Whether you choose a point of sale tabletop mount or a kiosk style stand for a trade show setting, there is a model that will work perfectly. 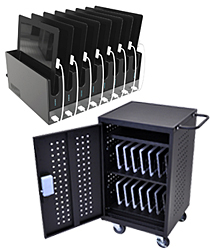 iPad podium display stands, including these floor standing or countertop lecterns with tablet holders, are often built for portability so they can be used at a variety of events. 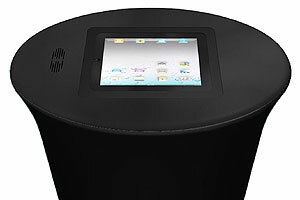 Other touchscreen lecterns are designed for long-term applications. The advantage for our customers is that we provide many of each style! 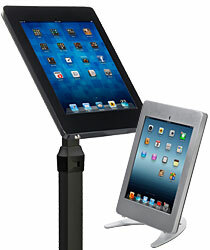 Most of these iPad podium display stands feature lightweight yet durable construction to withstand rigorous use. Because tablets can be quite expensive, several of the designs come equipped with locks or secure mounts to prevent theft and tampering in public environments. The combination of low cost, practical features, and elegant style makes any of our tablet display stands very desirable. 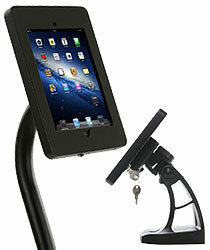 How do businesses and organizations use tablet kiosk mounts and stands? 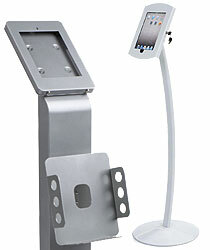 iPad podium display stands are commonly used within retail stores. Here, the tablet kiosks help provide additional details about newly arrived merchandise and can also assist sales associates in keeping customers informed about what's happening in the store. They can also be set up near the cash wrap or checkout counter as a way to collect leads, including customer information like phone numbers or e-mail addresses. This way, the information is saved directly to a database rather than written on paper. There are all kinds of apps that can be added as well that expand the possibilities and abilities of your store. Public speaking events, like press conferences and training seminars, are very common applications. Speakers are able to integrate the podium display stands into their presentations to keep their audiences captivated. Some of our lecterns with built-in tablet mounts feature clear acrylic designs that add that modern touch everyone is looking for. Captivate clients, students, and other audiences with one of these technologically advanced tablet displays. As was mentioned above, podium display stands for Apple tablets can also be found at the trade shows of many different industries. The touchscreen computers are eye-catching to passersby and encourage them to come over and check out your booth. They can be pre-loaded with a variety of videos and product specs for potential customers to watch. Tablets are also a great way to keep visitors occupied while your staff is dealing with other guests, giving them the opportunity to follow up once the videos are completed rather than losing the prospect altogether. Even the food industry is getting in on the action. You can spot Apple and Android podium display stands being used in restaurants more and more. They are frequently set up in waiting areas to give people an opportunity to check out a digital version of the menu before they're seated. 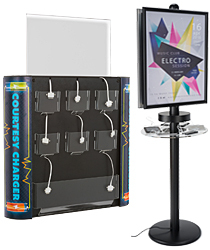 Commercial-grade podium display stands can also be found in hotels for similar reasons, as well as providing additional information about events occurring in the hotel itself and points of interest in the surrounding areas. This would provide a nice complement to the concierge desk, making it as easy as possible for your guests to get all of the information they desire. What different kiosk styles are offered here? Freestanding models are built to be set up on a sales floor or by a trade show booth. Since they usually resemble a pedestal or a podium to some degree (varying by model, of course), these stands often come to an ideal height for customers and passersby to use while standing right in front of them. Because they are often lightweight, they can easily be moved around yet the well-designed bases ensure they do not tip over when bumped by the crowds. The podium styles are also very effective for giving information presentations or speeches to the general public. Desktop & countertop designs are quite a bit smaller than the freestanding designs as they're meant to go on a table or counter. Some have bases that resemble picture frames, making them easy to rearrange within a store or office and be placed in the most convenient locations or easily offered to customers to use. Other designs feature desk clamps that, while temporary, keep the tablets firmly in place while providing a decent range of movement and accessibility. While a variety of designs are offered to keep your iPad well supported, many of these kiosks do share some similar features to make the iPad as easy as possible for customers to use. Many models (not all, especially on the stands that are built for higher security) provide strategic cut-outs to grant access to the charging ports, headphone jack, and power button. The trade show stands do let you choose whether to show your screen in either a landscape or portrait orientation, depending on which style meets your needs best. Many options also have angling mounts, letting you tilt the screen to find the best viewing angle for your visitors. And if any assembly is needed, it can be accomplished in just a few minutes so that you can start using the trade show kiosk almost immediately. 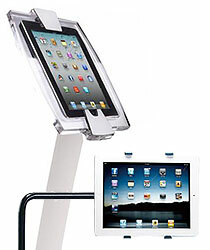 Some other tablet holder models also are equipped with a number of security features that make them useful in higher traffic areas or in locations where staff may not be able to keep as close an eye on the technology. 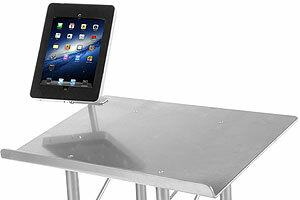 If that's the case, consider stands that incorporate frame locks, securing the iPad firmly within the enclosed casing. 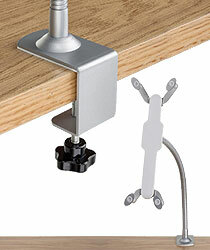 Other designs use screws or cables to affix the stand directly to the floor or a heavier object (such as a display cabinet or something similarly weighty) to make sure that it's nearly impossible for someone to walk off with your iPad.